Anticipation was high among the Titans girls high school basketball team as they headed to Telluride on Tuesday, January 24. 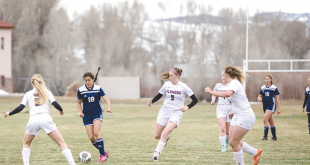 Telluride has been struggling this season as well and coach Mike Moran was expecting a tight game against their ski-town rivals. Unfortunately, slow moving feet from a bus ride and some unattainable height on Telluride’s team made for a tough game for the Titans, as they fell to Telluride 37-29. “I thought I’d seen some tall girls until I went to Telluride,” says Moran. Telluride used their height and the sleepiness of the Titans to build a 12-4 lead in the first quarter. But once the road legs wore off and the Titans adjusted, the two teams battled even through the next three quarters. The Titans started setting the pace in the second half as Moran called on his team to push hard up and down the court and look to attack from the perimeter. The plan played out well for the Titans as Siena Truex lit it up from behind the three-point arc, draining five threes in the second half with Sydney Petersen providing the assists. “We really started to roll and were pushing the ball in the third and fourth quarters,” says Moran. While the Titans continued to click with the ball, Telluride’s height inside proved too much to stop and Telluride managed to match wits with the Titans to maintain their lead from the first quarter the remainder of the game for the win. Truex led the Titans with 15 points, Petersen scored five and tallied six assists, while Lily Talbot and Tess Fenerty scored four points each. Meanwhile, Telluride’s twin towers accounted for 25 of their 37 points. “Our defense was pretty good but they just kept getting put-backs,” says Moran. The Titans then ran into not one but two buzz saws over the weekend, falling to Del Norte on Friday, January 27 68-10 and then Sargent on Saturday 63-8. Del Norte is ranked second in the state and took immediate control of the game, opening with a 25-0 lead. “They may be the best girls team I’ve seen in a long, long time,” says Moran. 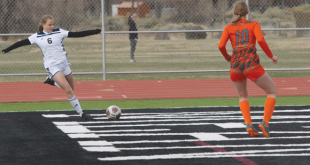 The Titans then struggled again on Saturday against Sargent, another one of four teams from the league that are making a name at the state level. Sargent jumped out to a 27-6 lead midway through the second quarter and kept it pinned to finish off the Titans 63-8. Remarkably, despite the constant struggles against top-flight teams each and every week, the Titans keep plugging along and Moran looks to see it pay off sooner rather than later. “We’re getting some respect for our effort and the underclassmen are improving and next year we should be better off,” says Moran. The tough times will continue this week as the Titans host 1A powerhouse Cotopaxi on Thursday in Mt. Olympus—tip-off is at 5:30 p.m. They return to the road on Saturday, February 4 to take on the Sanford Indians, who are fresh off a win over Sargent. “We’ve got some tough teams ahead of us,” says Moran. Copyright © 2019 Crested Butte News, Inc. All Rights Reserved.